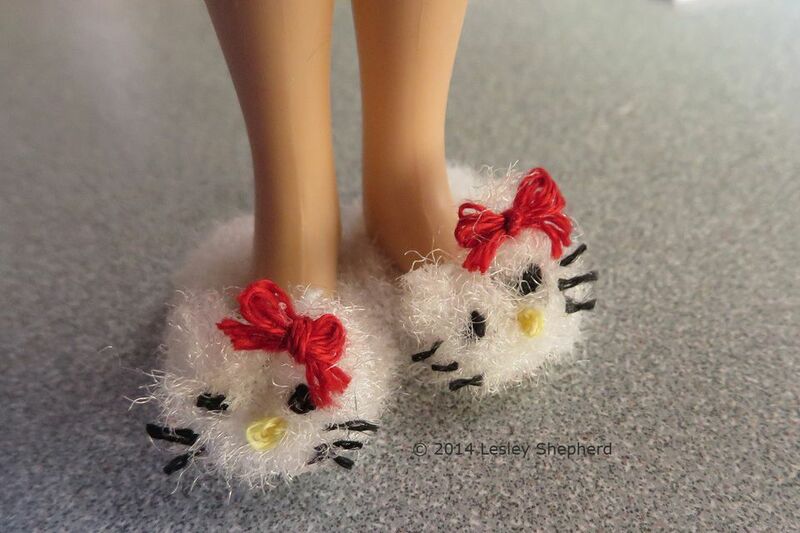 These fuzzy animal slippers are easy to make in any doll size. As shown here they are 1:12 scale, made from fly tying chenille trim, glue, craft foam or card (for the soles) and embroidery thread for the details. The character faces are easy to a range of animals. I used a minimum of tools, a toothpick to apply the glue, a needle and sharp scissors or a craft knife. Larger slippers can be made from ribbon or other trims for the slipper, still using chenille or a roll of fine terry cloth for the animal head. If you wish the doll to stand wearing the slippers, you will need to make sure the heel of the slipper is built to match the heel needed for the shape of the doll's foot. Barbie (Tm) for example will need high heeled mules instead of flat slippers. For plain (or decorated) slippers for dolls see the removable doll slipper instructions. I made the soles for my animal slippers from a piece of craft foam. If you don't have craft foam you can use lightweight card, or layers of card (from a cereal box or something similar) You want to build up the thickness of foam to make a sole which is a realistic thickness for your size of doll. To make the soles for the animal slippers, mark carefully with a pencil around the edge of the doll's feet as shown. To make the face sections for your doll's animal slippers, coil a length of chenille trim to the size of face you need for the front of the slipper. The face makes the toe section of the slipper so it will need to be slightly wider than your doll's foot at the toes. When you know how large a coil you need, cut the appropriate length, and apply glue to one edge to hold the flat coil together as you build the face section. Set the face sections aside to dry once they are made to a matching size. For some faces (rabbits or other animals with long ears) you may need to glue the extra fabric in place for the ears after you have shaped the coil. You can also plan on adding ears made of chenille or ribbon when you finish the facial details. To assemble your fuzzy animal slippers you will need two soles (mark them L and R if your doll has differently shaped feet). Cut them out from the foam or card as close to the line you marked in step 2 as possible. Check them against the feet of your doll to make sure they are the same size as the bottom of the doll's feet. If you are using scissors to cut out your soles, make sure you hold your scissors at right angles to the foam or card surface so the sole edges are not sloped or angled. For the sides of the slippers measure two lengths of your chenille (or ribbon) trim sized to wrap entirely around the sole, just meeting at the front. Glue the chenille trim (or a piece of ribbon) to the sides of the sole, leaving just the bottom edge of the sole visible. Test the slipper against the foot of your doll. If necessary, adjust the shape of the sole and re-apply the trim. Set the trimmed soles aside to dry. Take your two animal faces and trim them if necessary to define the ear shape (or you can add on ears made of ribbon or felt). Check that the face will cover the entire front of the slipper . It is okay if it is slightly too big, but it can be a problem if it is too small to cover the entire width of the slipper. Before you completely assemble the slippers, make the features you choose for your animal on the face section of your slippers. I used french knots for the eyes and nose of my kitten slippers. A bow made from embroidery thread suited the scale of the slipper and size of the face. You could also use small bits of felt or ribbon or glued on beads or rhinestones to make features for the face of your animal. A few stitches with colored thread are usually all that is needed to make the identity of the animal clear. For some animals, like rabbits, small pom-poms can be glued together to make a face. See the miniature fluffy Easter bunny for details. Make sure your features are securely glued or stitched in place before you proceed to finishing the slippers. When all the details on the face are securely glued in place, apply a bit of glue to the trim on the front of the slippers and set the faces across the front of the slipper leaning back at a slight angle as shown. Test fit the slippers on the doll and adjust the angle of the face across the toe of the slipper if necessary. The angle of the face should help to hold the slippers on the doll's foot. Note: for high heeled slippers, build up an appropriate heel from wood or layers of card attached to the back of the sole. Apply fuzzy trim only to the front half of the shoe, or drop the trim at the back of the slipper to cover part of the heel. Fit the faces onto the trim at the toe of the slipper, checking to ensure it fits across the angled toes of the high heeled doll. Have fun making fuzzy slippers for any occassion! Finer chenille trim or bits of felt can be used for antlers, bits of embroidery floss can be used to outline piglet or puppy noses. Chenille trim can be painted to make hedgehog spines.